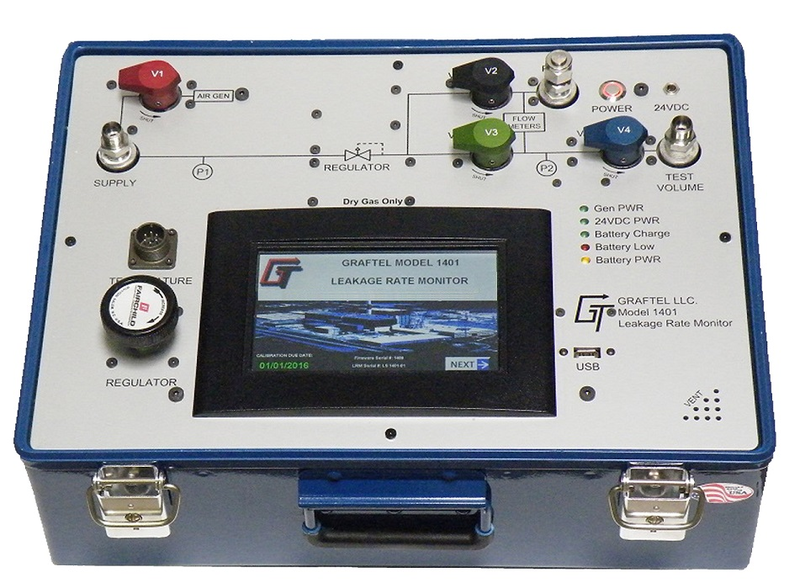 Curtiss-Wright Nuclear now offers a new generation of leak rate monitoring system. 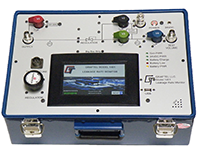 The Graftel 1401 is the industry standard in nuclear applications for leak detection. Our Local Leakage Rate Testing Systems are a compact, light-weight and rugged system used for performing flow make-up, or pressure decay Type B and C tests on valves, flanges, airlocks and other containment barriers. These state-of-the-art units utilize all digital flow instrumentation. The microprocessor based laminar flow elements may be relied upon to accurately and repeatability measure air or nitrogen flow. Flow rates are direct reading in units switchable between scfh, slm or sccm. Either air or nitrogen may be used. Pressure and temperature effects are automatically compensated for, no correction factors are ever required. Also available are the 1402 (mini leak rate monitor) and 9623-7 (classic leak rate monitoring system). Customized Data Recording Options The test data file name can be customized by the user to indicate the valve number/ test location and the initials of the tester.These custom file names can be manually entered through the touchscreen or uploaded onto the permanent memory of touchscreen using a USB flash drive. Re-Calibration The 3 flow meters and the two pressure gauges can also be re-calibrated and adjusted through the touch-screen interface. Pressure Decay Testing Extreme accuracy optional absolute pressure transmitter for pressure decay testing large volumes such as airlocks and purge valves. Diagnostic Check New color touchscreen program enables the user to run diagnostics on all flow and pressure sensors to check for any problems and save the results on a USB flash drive. The results can then be emailed to Graftel so that we can help you identify and troubleshoot any issues. WiFi An on-board Wi-Fi radio allows the user to control the LRM touchscreen on a LAN connected PC. The wirelessly transmitted LRM data can be seen and saved real-time on the PC. Automated Calibration Using the Compass software along with a flow standard such as the Fluke molbocs, the user has the ability to perform a full calibration of the 1401 leak rate monitor. A predetermined test pressure is maintained within the test volume using a precision pressure regulator. For makeup flow, after the test gas has stabilized within the test volume, a maintenance flow through the system compensates for any leakage in the test volume. This maintenance flow is equal to the amount of leakage in the test volume, and is measurement and displayed by the precision mass flowmeters. In pressure decay applications, after the test gas has stabilized, the instrument is isolated from the test volume except for the pressure sensor. This sensor measures the drop in pressure caused by a leak within the test volume. This pressure loss, over time, is directly related to the leakage rate. Laminar element flowmeters auto ranging allow for direct reading without requiring corrections for temperature or pressure, and do not require warm up time like thermal mass flowmeters. These flowmeters provide high accuracy and responsiveness and can withstand pressurization and flow fluctuations without damage.